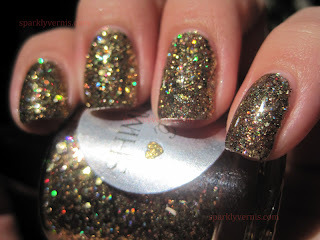 I am a big fan of gold glitters, so when I see them in the bottle, I have great expectations. Tracy definitely exceeded my expectations. 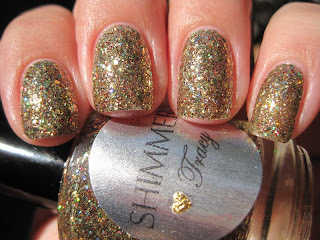 It has different sizes of gold glitter, including short bar glitter which is hardly noticeable. I first tried it layered and was happy with the coverage, in some pictures you can see tiny specs of red microglitter, this red dissapears when it is by itself. When layered it did not look as holographic as it looked in the bottle, but once I tried it by itself, I was blown away by the holographic effect. 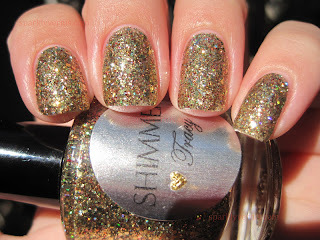 I also love this shade of gold, it is not too yellowish, it is dark and classic. The way this sparkles, both indoors and outdoors, is very special. I hope my pictures capture some, but if you love gold, you definitely need to see this in real life. 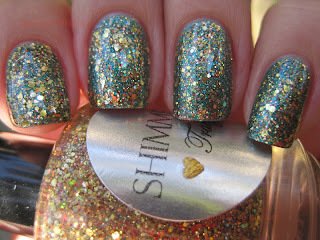 i love the Shimmers!!!! 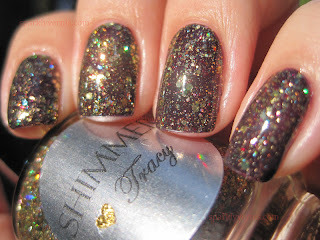 She needs to ship international so i can get my shimmer on too!!! I absolutely love it over Blue Marine!! So pretty! I really love those combos A! I never woulda thought to put Green and Gold together, how neat! Really love this over the OPI!!! Just Gorgeous! !